There’s one thing we all know – The Rock is one of our favorite fitness celebrities on the planet. He brings bodybuilding mentality (and physique) to the masses in a really, really exciting way. It seems like every day The Rock is doing something amazing on the internet. Breaking new PR’s. 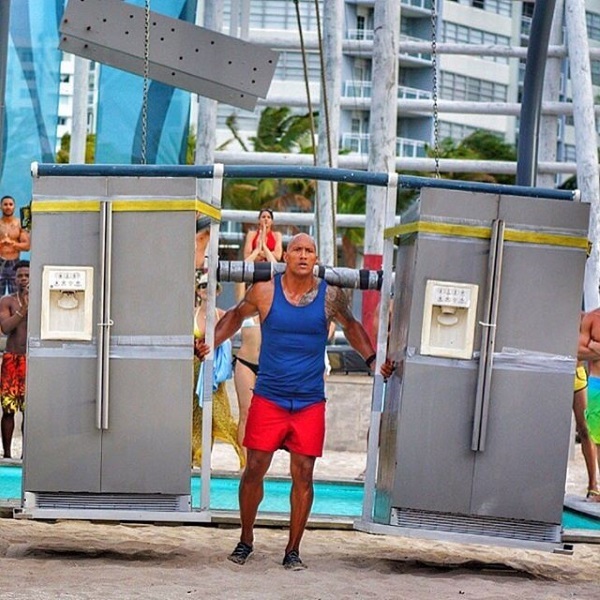 Lifting iron like a beast… and now going full-on strongman by lifting two gigantic refrigerators. This man truly has no limits. The best part about all of this is the fact that it’s all for the BAYWATCH movie. Not Furious 7, not some new action packed serious movie, but instead a reboot of cheesy ol’ Baywatch. That’s how badass The Rock is. He’s always pushing the limits… even for a movie that might just be terrible. We’ll see. Share your love for The Rock by hitting up our comments below or on Facebook and Twitter. Stay pumped.